Climbing School is a straight way get close to alpine climbing. For instance, it could all began from a friend, that brought you on a crag for the first time, and you finally approached the feeling of being suspended in the air on a rope , and if you liked it, the next step is to start with a training. 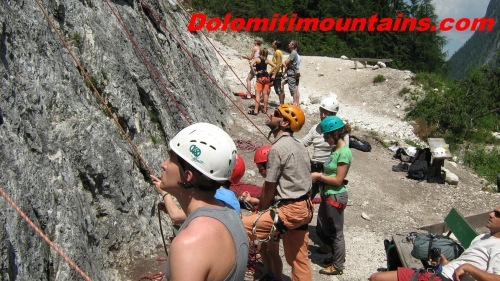 Today the Climbing School is obligatorily held by the Alpine Guides, and are the only ones by law, to teach the climbing techniques. 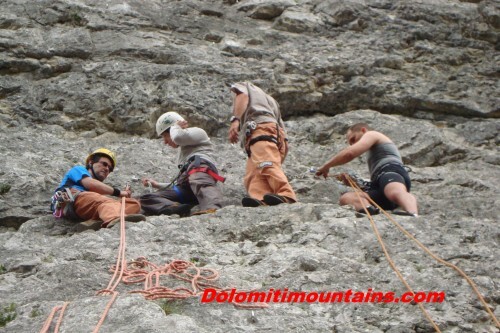 The CAI (alpine italian club) had for years formed skilled new climbers. The CAI personnel is highly qualified and holds courses in the city as well, in indoor climbing gyms, where people can train and thus facilitated once they approach to the mountains. These courses, originally, have been part of a project that wanted to teach basic knowledges of mountaineering through an educational training to the mountain inhabitants. Therefore, giving a technical support to people, made them confident to go for a walk or trekking on the mountains and perhaps, try to get on difficult routes. Once, the training lasted a couple of months. It was divided in theory and practical lessons. Classes were taken, teaching all the different characteristics of the climbing equipment: ropes, quickdraws, harness, furthermore, how to make the nods and in which circumstances they had to be done. After having trained on drywalls, in order to develop the techniques, people could practice in open spaces, Getting rock climbing tips from the teachers. Nowadays though, the courses are very brief, and just two weeks before or after summertime, it takes place the first climbing lesson on a cliff, and after the first instructions on how to wear a harness and a couple of notions, you can start experiencing the professional sport climbing. The end of the training is just the beginning of the long learning path for a climber that requires a hard training to achieve good results. Today, as it was in the past, Climbing Courses have one thing in common: security most of all. Constantly, the instructors make present of every single movement that you do while you go up, it must be done under the complete conscience of being well bond on a rope and without faltering one’s self. Step by step, after learning all the maneuvers on the wall, the Alpine Guides teach you how to avoid wrong maneuvers formerly made by someone else that brought to drastic consequences sometimes. Little by little, you can learn different enhancing techniques, learn how to belay your partner or have a rest, and learn a variety of useful techniques that help you overcome tricky situations. Thanks to the Climbing School you can meet your future partners in these adventure, people like you, having the same training background and whom you can trust. Off the cliffs you can start with the first climb in a multi-pitch environment, improve the technique and in the meantime, intensifying the difficulty level.